I first started making whistles around 2005 or 2006. I began with a metalworking lathe, but do most of my work on a woodworking lathe now, with chisels and gouges. I work in various hardwoods, using standard woods like various rosewoods and boxwood, but liking to mix it up with other woods available commercially, and also wood that I’ve harvested myself in the area (read: trees that have met their ends in my yard or yards of friends and family). Whistles from high-density, resinous woods like blackwood or other rosewood-family members either have no finish at all or just Renaissance Wax on the outside. I generally give the less-dense woods I work with, like dogwood, a treatment with tung oil. I prefer to leave box unfinished, but can be sweet-talked into giving it a moisture barrier. D whistles, left to right: Osage orange, Burmese blackwood, olivewood, four in pear wood. I’ve settled on standard designs for D and C whistles with brass tuning slides and brass or aluminum beaks and rings. Fipple blocks are all cedar. I’ll sometimes make all-wood whistles with or without slides, or whistles with acetal copolymer fittings, these all from wood I’ve cut myself or obtained from friends who cut it. 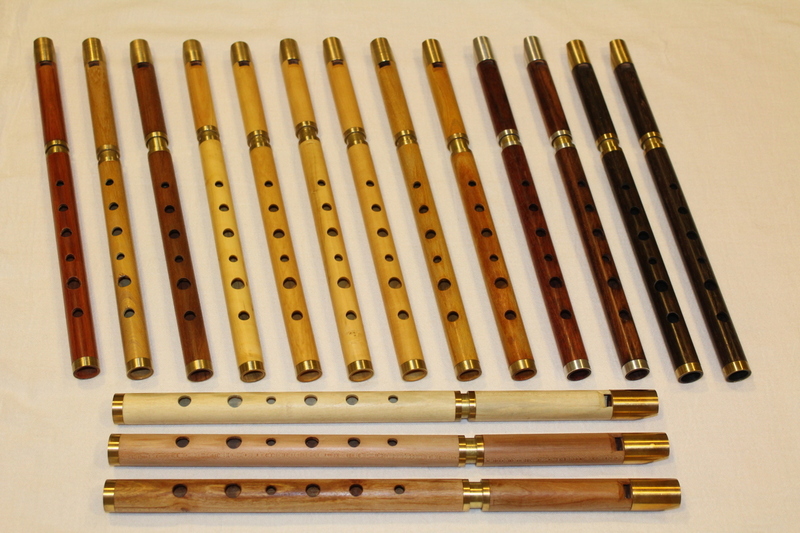 I’m actively researching a tapered-bore D whistle, the first step toward my eventual goal of making wooden flutes. I’ve also just started on making A and Bflat whistles. These will have the same bore diameter, so will be available as sets with two bodies and one mouthpiece. The whistle designs are loosely based on those of Glenn Schultz and Chris Abell, with heavy influences from Phil Bleazey, Jon Swayne, and Michael Grinter, and a few touches of my own. I like a traditional whistle sound, pure with a touch of chiff and woodiness and not too much sweetness. My goal is to make something that is nicely balanced across the octaves, both in ease of play and volume. I’ve settled on a standard price of $125 for D whistles, $60 for all-wood single piece whistles, and $85 for all-wood with slides. I’ll adjust the price up for blackwood or boxwood. I’ll also adjust downward for wood I didn’t buy, or if a whistle has a flaw in the finishing or sound, for example a misshapen tonehole, a stray saw mark, weak bell note, or taking too much push in the second octave. Standard price for C whistles is $175 again with a premium for blackwood or boxwood. Due to CITES regulations, I can’t ship rosewood (genus Dalbergia) whistles internationally. Rosewoods I currently work in in include African blackwood, tulipwood, Burmese rosewood, and East Indian rosewood. Oddly, Bolivian rosewood is not a true rosewood. There are lots of non-Dalbergia species that make good whistles. These include boxwood, purpleheart, mopane, Osage orange, tembooti, goncalo alves, Bolivian rosewood, bloodwood, etc. I always play each whistle extensively to allow me to try to describe the sound and playability individually. I post photos of each whistle with the tuning slide pulled out so that the whistle plays at A440 for me. Note that I play a little flat, so for many people the slide would be out a few mm further.